Career options for Work at Home Moms are just as varied as those for Working Moms. As a WAHM you might be a sales rep for a company. You might be starting a direct sales business of some kind. Maybe you had a job before you became a mom and are now just working that same job out of your house. You might be staring a business of a different kind. Maybe you want to become a professional blogger. The list just goes on and on. These different career paths are going to lead to different challenges as a Work at Home Mom. If you are in direct sales you are probably going to need to work more on weekends and evenings. If you are a sales rep or still work your job just at home you are going to need to work more during the day. There is one common challenge of all work at home moms. We are working at home with our kids right here with us - especially over the summers. 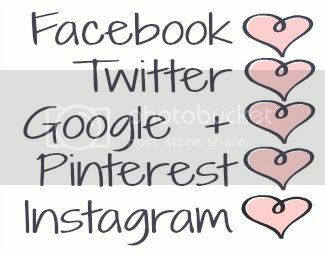 If you were to search “WAHM Tips” you will find TONS of tips. What you won’t find … tons of tips if you have attention seeking vampires YOUNG children. Let me start by saying I love my children. I enjoy being able to be home with them. Sometimes they are attention seeking, energy draining vampires! When I first wrote this post my children were 3 ½ and 18 months. Two very active toddlers/preschoolers who most of the time get along, but when they don’t - watch out! Not much of that has changed ...except the getting along most of the time! Okay, so it has all changed - accept the attention seeking vampire part. My kids are now 6 1/2 and 4 1/2. We have moved since this original posting. We have a year of school under our belts. Mommy went from working at home to working at a school to back to working at home. This is STILL my typical day: They are playing - “Mommy will you read this?” Five minutes later, “Mommy can you get this?” As soon as I pick up the phone to make a call - they are playing I have 5 minutes, right? Wrong. “Mommy.” "Mommy!" "Mommy!" 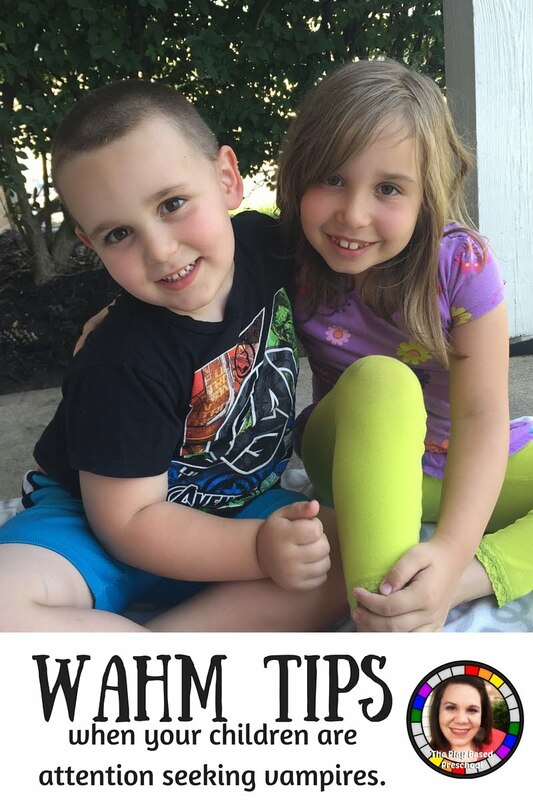 Here are my WAHM Tips for when your children are 3 and under. For my two when they were really little I didn't use a schedule. If I get a request or two within 5 minutes. I will save whatever I am working on and step away from the computer. I am going to give them 30 to 60 minutes of undivided attention. Turn off the phone alerts, close the laptop, turn off the monitor - do whatever you need to, to not be distracted. Typically the only reason I have my phone with me is because I am might take some pictures of us being silly. Give that time to your kids. You will find that if you do this that next 30-45 minutes is going to be some productive time. When my two were small we still had a basic schedule. They got up around 7:30, napped around 12:30 to 3:30, we ate dinner around 5, they got Daddy Duty from 7 to 8, bedtime was 8pm. I cannot tell you how much of a life saver even just this super basic schedule was. I knew if I was having a really unproductive morning, I would have from 12:30 to 3:30 for some laser focused productive time. I also knew that if I got up earlier than 7:30 I would have some great productivity there too. There are going to be days that just don't work out the way you planned. Think about it if you were at a corporate job - stuff happens. Not as crazy as things at home, but stuff does happen. You need to accept that. I know I still do! They still need it. When they are "Mommy, Mommy, Mommy!" they need my attention. I will get more done if I fill their attention tanks than if I leave them to their own resources. Here is where our biggest change has happened. Now that they are older we can have a more set schedule. We still have a pretty basic schedule. They are not allowed to come out of their rooms until 8 am. (Every morning at 7:20 I get a hug from the back and "I have to go potty, see you again when the clock says 8 from the little one, but it works.) Mommy work time is from 5 to 8. From 8 to 10:30 it is kid time. I agree to spend time with them, I can answer the phone and take care of that one particular thing if it is quick, but that is their time. 10:30 to 11:30 is kid play time, Mommy work time. We have lunch around 12, and they have quiet time from 1:30 to 3:30. Kid time picks up at 3:30 until 7:30. Daddy takes over until 8:30, then it is bedtime. I still have to embrace flexibility. It is different now though. It is more okay, a playdate here or story time there. I plan these things in and we plan Mommy-Work-Time around it. For example - these two love story time with Ms. Heather at our local IKEA. The plan is we don't do kid time that morning. Mommy, gets work done during that time so that we can go to IKEA. If they don't let me get work done, we don't go. My biggest tip for you -- regardless of their ages: Find what works for you. Is getting up at 5 am just not an option for you? Well, is staying up later to get work done an option? Do you need to maybe enlist help one or two afternoons a week? That is not an option for me, but maybe it is for you. I actually have started paying my kids to let me work. They are trying to earn extra "commission" to get some big toys right now. So my husband and I agreed that they can earn up to a $1 a day to let mommy get some extra work time. We have only tried a few times, but it might work well. 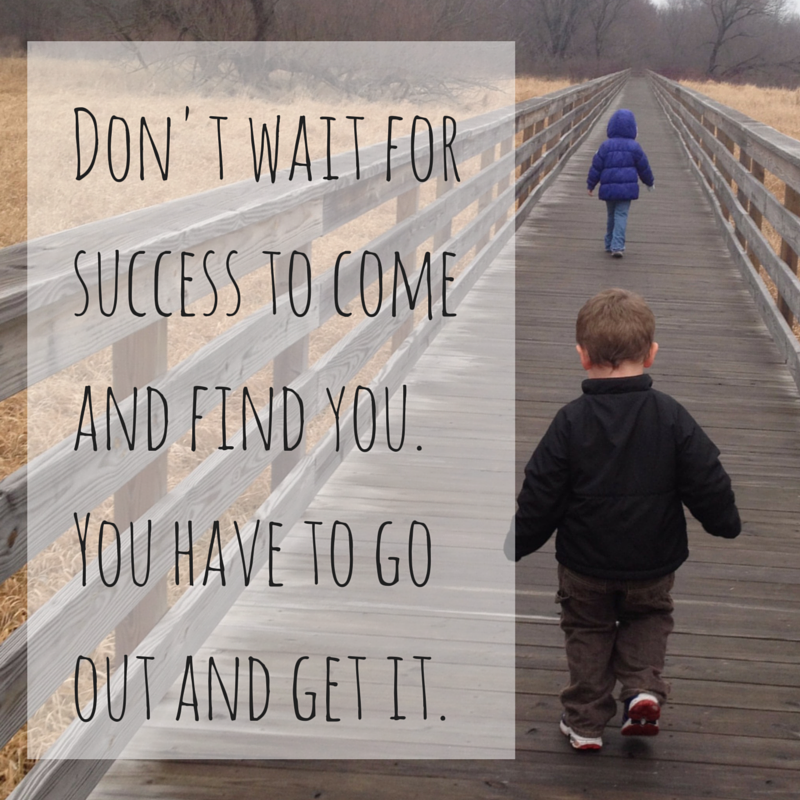 Work at Home Mama -- YOU CAN DO THIS!